"We had Les Allen and Bobby Smith...who at the time were akin to today's Messi & C.Ronaldo". Colin said, as he wiped off the dust on a TV set. "I used to watch this team here, on my first ever Black & White TV. The '61 team created modern football with its style and panache"
A popular FM challenge known as 'The Pentagon Challenge' has inspired many FMers to chop and change their management career in order to appear fresh to the masses. In this save, I want to do something similar...but rather take it in another direction: 'The Monogon Challenge'. The Monogon's aim is to win a solitary league cup by 2020. If I achieve this, I will aim to win the same trophy within the next 2 years. The challenge will only be complete when I turn all of my Monogons into a 'Decagon' (10 league cups in 20 years). If I do this, I will have completed the challenge and will probs start playing Pokemon, as they sound similar. Could the 'League Cup Decagon' rival the achievements of Real Madrid's European Cup 'Decima'? I think so. After analysing the Tottenham First Team it was clear they needed an experienced head in the centre of midfield. Eric Dier is fairly young and English and Moussa Dembélé is incredibly overrated. So I turned my attentions to Cameroonian star Stéphane Mbia. Mbia (31) knows the English game well, starring for Mark Hughes' QPR side and came close to moving to White Hart Lane when Tottenham’s Legendary Manager Harry Redknapp was in charge. The fee is big, as I had to prize him away from Chinese club Hebei China Fortune: £18.25m...but it represents my commitment to Tottenham's short term ambitions. Mbia is back in London and in his prime years, according to FM! Dos Santos, could he be my Salah? Following Mbia is 28 year old Giovani Dos Santos, an ex-Spurs man at the height of his powers. I wanted an accomplice for Harry Kane and I see this as the perfect Big Man-Little Man combo. Again, the fee is fairly big: £15m...as LA Galaxy had him on a fairly high contract. But bringing one of Mexico's greatest ever players back to North London is a coup for both the club's fans and the English Premier League. The final deal, which concludes my Summer spending, is Southampton's Ryan Bertrand (28). He signs on for £23m and I hope to see him become England's 1st choice Left Back in next Summer's World Cup. Bertrand is ex-London after coming through Chelsea's famed academy, so I know he is going to be golden on the left side of my team. We're doing this for Colin (mentioned in my introduction). I want attacking football in this FM18 side save, so Wing Backs and x3 Strikers are a must. Mbia will be there to hold, alongside Dier as Double Halfbacks. This means we only need one Centre Back - who will play as a Ball Playing one in order to transition quickly and pass more direct. This leaves room in the centre of the park for two Mezzalas in the MC slots to dominate the half spaces. So, 1-1-4-2-3 (as I count my Sweeper Rush Goalie as an outfield player...like a lot of Twitter tactic hipsters). The 'Mind The Gap' tactic. We're 10 games into the season (all comps) and the 1-1-4-2-3 has made for some great drama, none of which I saw however as I was using the Instant Result button on FM Touch. We opened up with a derby loss Vs Watford, but then had great wins against Huddersfield and West Brom. The formation is not so good against the giants of Bayern Munich or Man City, so I may have to be less attacking in the future. In the English Premier League, we sit 7th. Behind both Manchester clubs, Liverpool and Arsenal, which is what we would probably expect. Realistically I hope to push on and displace Southampton from 5th. That has to be my aim. We did have a great win Vs Swansea in The Monogon Challenge though, but it did require help. 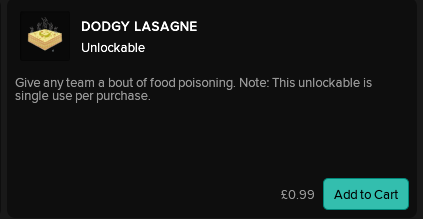 I've decided to spend £0.99 on dodgy lasagne for every Carabao Cup game. I figured this would be a great way to find retribution from when Arsenal poisoned us in 2006. Next up is Man City, who are the reason for us recently refunding travelling fans, as we were slaughtered 6-0 at the Etihad Stadium. Get the lasagne out lads! [From left to right]: Home, Away & a special 57 year anniversary Third kit for the 1961 title win. Big thanks to @FMPressure for making these beauties. After playing 10 games I did hope to continue this Spursy journey over FM18's life cycle, but my Estudiantes save is literally too fun right now (do check my story out here: www.fmgrasshopper.com/fm18). So I therefore offer up this Spursy file as a succession save. DM me your details and I can send it over to you. Can you bring the Monogon home?